"Magnetic North" redirects here. For other uses, see Magnetic North (disambiguation). Location of the North Magnetic Pole and the North Geomagnetic Pole in 2017. The North Magnetic Pole moves over time due to magnetic changes in Earth's core. In 2001, it was determined by the Geological Survey of Canada to lie west of Ellesmere Island in northern Canada at 81°18′N 110°48′W﻿ / ﻿81.3°N 110.8°W﻿ / 81.3; -110.8﻿ (Magnetic North Pole 2001). It was situated at 83°06′N 117°48′W﻿ / ﻿83.1°N 117.8°W﻿ / 83.1; -117.8﻿ (Magnetic North Pole 2005 est) in 2005. In 2009, while still situated within the Canadian Arctic territorial claim at 84°54′N 131°00′W﻿ / ﻿84.9°N 131.0°W﻿ / 84.9; -131.0﻿ (Magnetic North Pole 2009), it was moving toward Russia at between 55 and 60 kilometres (34 and 37 mi) per year. As of 2017, the pole is projected to have moved beyond the Canadian Arctic territorial claim to 86°30′N 172°36′W﻿ / ﻿86.5°N 172.6°W﻿ / 86.5; -172.6﻿ (Magnetic North Pole 2017 est). Its southern hemisphere counterpart is the South Magnetic Pole. Since Earth's magnetic field is not exactly symmetrical, the North and South Magnetic Poles are not antipodal, meaning that a straight line drawn from one to the other does not pass through the geometric center of Earth. All magnets have two poles, where the lines of magnetic flux enter and emerge. By analogy with Earth's magnetic field, these are called the magnet's "north" and "south" poles. The convention in early compasses was to call the end of the needle pointing to Earth's North Magnetic Pole the "north pole" (or "north-seeking pole") and the other end the "south pole" (the names are often abbreviated to "N" and "S"). Because opposite poles attract, this definition means that Earth's North Magnetic Pole is actually a magnetic south pole and Earth's South Magnetic Pole is a magnetic north pole. The direction of magnetic field lines is defined such that the lines emerge from the magnet's north pole and enter into the magnet's south pole. Part of the Carta Marina of 1539 by Olaus Magnus, depicting the location of magnetic north vaguely conceived as "Insula Magnetū[m]" (Latin for "Island of Magnets"), off modern-day Murmansk. The man holding the rune staffs is the Norse hero Starkad ("Starcaterus"). Early European navigators, cartographers and scientists believed that compass needles were attracted to a hypothetical "magnetic island" somewhere in the far north (see Rupes Nigra), or to the Pole Star. The idea that Earth itself acts as essentially a giant magnet was first proposed in 1600, by the English physician and natural philosopher William Gilbert. He was also the first to define the North Magnetic Pole as the point where Earth's magnetic field points vertically downwards. This is the definition used nowadays, though it would be a few hundred years before the nature of Earth's magnetic field was understood with modern accuracy and precision. The first expedition to reach the North Magnetic Pole was led by James Clark Ross, who found it at Cape Adelaide on the Boothia Peninsula on June 1, 1831. Roald Amundsen found the North Magnetic Pole in a slightly different location in 1903. The third observation was by Canadian government scientists Paul Serson and Jack Clark, of the Dominion Astrophysical Observatory, who found the pole at Allen Lake on Prince of Wales Island in 1947. At the start of the Cold War, the United States Department of War recognized a need for a comprehensive survey of the North American Arctic and asked the United States Army to undertake the task. An assignment was made in 1946 for the newly formed Army’s Air Corps Strategic Air Command to explore the entire Arctic Ocean area. The exploration was conducted by the 46th (later re-designated the 72nd) Photo Reconnaissance Squadron and reported on as a classified Top Secret mission named Project Nanook. This project in turn was divided into many separate, but identically classified, projects, one of which was Project Polaris, which was a radar, photographic (trimetrogon, or three-angle, cameras) and visual study of the entire Canadian Archipelago. A Canadian officer observer was assigned to accompany each flight. The centre of the north magnetic dip pole was on Prince of Wales Island some 400 kilometres (250 mi) NNW of the positions determined by Amundsen and Ross, and the dip pole occupied a larger elliptical area,[clarification needed] with foci about 400 km (250 mi) apart on Boothia Peninsula and Bathurst Island. … we agree on one point and that is the presence of what we can call the main magnetic pole on northwestern Prince of Wales Island. I have accepted as a purely preliminary value the position latitude 73°N and longitude 100°W. Your value of 73°15'N and 99°45’W is in excellent agreement, and I suggest that you use your value by all means. Speed of the north magnetic pole according to the IGRF-12 model. The Canadian government has made several measurements since, which show that the North Magnetic Pole is moving continually northwestward. In 2001, an expedition located the pole at 81°18′N 110°48′W﻿ / ﻿81.3°N 110.8°W﻿ / 81.3; -110.8﻿ (Magnetic North Pole 2001 location). In 2007, the latest survey found the pole at 83°57′N 120°43′W﻿ / ﻿83.95°N 120.72°W﻿ / 83.95; -120.72﻿ (Magnetic North Pole 2007 location). During the 20th century it moved 1100 km, and since 1970 its rate of motion has accelerated from 9 km/year to approximately 52 km/year (2001–2007 average; see also Polar drift). Members of the 2007 expedition to locate the magnetic north pole wrote that such expeditions have become logistically difficult, as the pole moves farther away from inhabited locations. They expect that in the future, the magnetic pole position will be obtained from satellite data instead of ground surveys. As of early 2019, the magnetic north pole is moving from Canada towards Siberia at a rate of approximately 55 km (34 miles) per year. The first team of novices to reach the Magnetic North Pole did so in 1996, led by David Hempleman-Adams. It included the first British woman Sue Stockdale and first Swedish woman to reach the Pole. 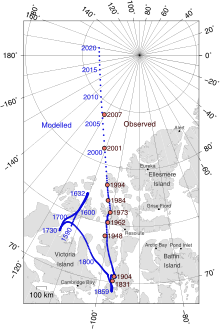 The team also successfully tracked the location of the Magnetic North Pole on behalf of the University of Ottawa, and certified its location by magnetometer and theodolite at 78°35.7′N 104°11.9′W﻿ / ﻿78.5950°N 104.1983°W﻿ / 78.5950; -104.1983﻿ (Magnetic North Pole 1996). The biennial Polar Race takes place between Resolute Bay in northern Canada and the 1996-certified location of the North Magnetic Pole at 78°35.7′N 104°11.9′W﻿ / ﻿78.5950°N 104.1983°W﻿ / 78.5950; -104.1983﻿ (Magnetic North Pole 1996). On 25 July 2007, the Top Gear Polar Challenge Special was broadcast on BBC Two in the United Kingdom, in which Jeremy Clarkson and James May (and their support and camera team) became the first people in history to reach this location in a car. Historically, the magnetic compass was an important tool for navigation. While it has been widely replaced by global positioning systems, many airplanes and ships still carry them, as do casual boaters and hikers. The direction in which a compass needle points is known as magnetic north. In general, this is not exactly the direction of the North Magnetic Pole (or of any other consistent location). Instead, the compass aligns itself to the local geomagnetic field, which varies in a complex manner over Earth's surface, as well as over time. The local angular difference between magnetic north and true north is called the magnetic declination. 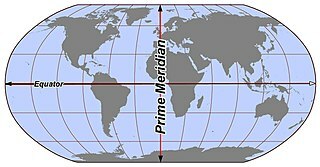 Most map coordinate systems are based on true north, and magnetic declination is often shown on map legends so that the direction of true north can be determined from north as indicated by a compass. In North America the line of zero declination (the agonic line) runs from the North Magnetic Pole down through Lake Superior and southward into the Gulf of Mexico (see figure). Along this line, true north is the same as magnetic north. West of the agonic line a compass will give a reading that is east of true north and by convention the magnetic declination is positive. Conversely, east of the agonic line a compass will point west of true north and the declination is negative. As a first-order approximation, Earth's magnetic field can be modeled as a simple dipole (like a bar magnet), tilted about 10° with respect to Earth's rotation axis (which defines the Geographic North and Geographic South Poles) and centered at Earth's center. The North and South Geomagnetic Poles are the antipodal points where the axis of this theoretical dipole intersects Earth's surface. If Earth's magnetic field were a perfect dipole then the field lines would be vertical at the Geomagnetic Poles, and they would coincide with the Magnetic Poles. However, the approximation is imperfect, and so the Magnetic and Geomagnetic Poles lie some distance apart. Like the North Magnetic Pole, the North Geomagnetic Pole attracts the north pole of a bar magnet and so is in a physical sense actually a magnetic south pole. It is the center of the region of the magnetosphere in which the Aurora Borealis can be seen. As of 2015 it was located at approximately 80°22′N 72°37′W﻿ / ﻿80.37°N 72.62°W﻿ / 80.37; -72.62﻿ (Geomagnetic North Pole 2005 est), over Ellesmere Island, Canada but it is now drifting away from North America and toward Siberia. Over the life of Earth, the orientation of Earth's magnetic field has reversed many times, with magnetic north becoming magnetic south and vice versa – an event known as a geomagnetic reversal. Evidence of geomagnetic reversals can be seen at mid-ocean ridges where tectonic plates move apart and the seabed is filled in with magma. As the magma seeps out of the mantle, cools, and solidifies into igneous rock, it is imprinted with a record of the direction of the magnetic field at the time that the magma cooled. ^ Merrill, Ronald T.; McElhinny, Michael W.; McFadden, Phillip L. (1996). "Chapter 8". The magnetic field of the earth: paleomagnetism, the core, and the deep mantle. Academic Press. ISBN 978-0-12-491246-5. ^ Wei-Haas, Maya (4 February 2019). "Magnetic north just changed. Here's what that means". Science & Innovation. National Geographic. Retrieved 5 February 2019. ^ a b World Data Center for Geomagnetism, Kyoto. "Magnetic North, Geomagnetic and Magnetic Poles". Retrieved 2012-07-03. ^ "The Magnetic North Pole". Ocean bottom magnetology laboratory. Woods Hole Oceanographic Institution. Retrieved 2017-02-06. ^ Serway, Raymond A.; Chris Vuille (2006). Essentials of college physics. USA: Cengage Learning. p. 493. ISBN 0-495-10619-4. Retrieved 2012-04-19. ^ Russell, Randy. "Earth's Magnetic Poles". Windows to the Universe. National Earth Science Teachers Association. Retrieved 2012-04-19. ^ a b White, Ken (1994). World in Peril: The Origin , Mission & Scientific Findings of the 46th / 72nd Reconnaissance Squadron (2nd revised ed.). K. W. White & Associates. ISBN 978-1883218102. ^ Wack, Fred John (1992). The Secret Explorers: Saga of the 46th/72nd Reconnaissance Squadrons. Seeger's Print. ^ Press, Associated (5 February 2019). "Polar express: magnetic north pole moving 'pretty fast' towards Russia" – via www.theguardian.com. ^ "Geomagnetism, North Magnetic Pole". Geological Survey of Canada. Natural Resources Canada. Archived from the original on 2010-03-26. Retrieved 11 January 2009. ^ "Poles and Directions". Australian Antarctic Division. 2011. Retrieved 2017-02-06. ^ "Polar Challenge". Top Gear. 25 July 2007. 0:22 minutes in. BBC Two. Retrieved 19 April 2012. ^ "Compass". National Geographic Society. 3 December 2013. Retrieved 25 August 2018. ^ "Magnetic declination". Natural Resources Canada. Government of Canada. Retrieved 25 August 2018. ^ USGS Education. "How To Use a Compass with a USGS Topographic Map". United States Geological Survey. Retrieved 25 August 2018. ^ a b "Geomagnetism Frequently Asked Questions". National Geophysical Data Center. Retrieved 2018-04-28. ^ "Earth's Inconstant Magnetic Field - Science Mission Directorate". science.nasa.gov. "Wandering of the geomagnetic poles". Geomagnetism. National Geophysical Data Center. Retrieved 19 April 2012. "Geomagnetism". Natural Resources Canada. April 1, 2012. Retrieved 19 April 2012. "North Magnetic Pole could be leaving Canada". CNN.com. 20 March 2002. Retrieved 19 April 2012. "Magnetic pole drifting fast". BBC News. 12 December 2005. Retrieved 19 April 2012. Nemiroff, R.; Bonnell, J., eds. (25 November 2002). "The Earth's magnetic field". Astronomy Picture of the Day. NASA. Retrieved 2012-04-19. A compass is an instrument used for navigation and orientation that shows direction relative to the geographic cardinal directions. Usually, a diagram called a compass rose shows the directions north, south, east, and west on the compass face as abbreviated initials. When the compass is used, the rose can be aligned with the corresponding geographic directions; for example, the "N" mark on the rose points northward. Compasses often display markings for angles in degrees in addition to the rose. North corresponds to 0°, and the angles increase clockwise, so east is 90° degrees, south is 180°, and west is 270°. These numbers allow the compass to show magnetic North azimuths or true North azimuths or bearings, which are commonly stated in this notation. If magnetic declination between the magnetic North and true North at latitude angle and longitude angle is known, then direction of magnetic North also gives direction of true North. This is a list of geophysicists, people who made notable contributions to geophysics, whether or not geophysics was their primary field. These include historical figures who laid the foundations for the field of geophysics. More recently, some of the top awards for geophysicists are the Vetlesen Prize ; the William Bowie Medal ; and the Crafoord Prize for geosciences. Some geophysicists have also won more general prizes such as the Nobel Prize and the Kyoto Prize. Magnetic declination, or magnetic variation, is the angle on the horizontal plane between magnetic north and true north. This angle varies depending on position on the Earth's surface and changes over time. Magnetic dip, dip angle, or magnetic inclination is the angle made with the horizontal by the Earth's magnetic field lines. This angle varies at different points on the Earth's surface. Positive values of inclination indicate that the magnetic field of the Earth is pointing downward, into the Earth, at the point of measurement, and negative values indicate that it is pointing upward. The dip angle is in principle the angle made by the needle of a vertically held compass, though in practice ordinary compass needles may be weighted against dip or may be unable to move freely in the correct plane. The value can be measured more reliably with a special instrument typically known as a dip circle. Sea turtle migration refers to the long-distance movements of sea turtles notably as adults but may also refer to the offshore migration of hatchings. Sea turtle hatchings emerge from underground nests and crawl across the beach towards the sea. They then maintain an offshore heading until they reach the open sea. The feeding and nesting sites of adult sea turtles are often distantly separated meaning some must migrate hundreds or even thousands of kilometres. The history of geomagnetism is concerned with the history of the study of Earth's magnetic field. It encompasses the history of navigation using compasses, studies of the prehistoric magnetic field, and applications to plate tectonics.